Looking for new culinary adventures, I couldn’t have been happier to arrive in this land of new tastes, new spices and new ingredients. Corn is one of my favorite foods and it is found in dozens of dishes. With 3,000+ miles of Pacific seashore, it only stands to reason that the seafood is going to be excellent here as well – and it was. Here are a few of the places I can honestly vouch for, having dined at each. Ambrosia (Merced 838 A; Santiago Centro; Telephone (56-2) 697 20 23) is right in the midst of the central business district and is a great place to go for lunch. Their Salmon con Salsa de Alcaparras was outstanding. 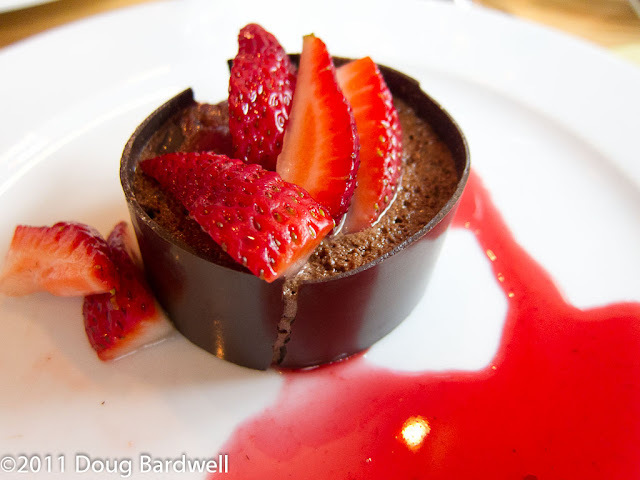 For chocoholics, you’ll want to try the Marquise de chocolate con Salsa de Frambuesa – chocolate mousse wrapped in a dark-chocolate skin with fresh strawberries. It’s located right across a courtyard from the Red House (Casa Colorado) Museum. Only 500 pesos to enter, there are a number of worthwhile exhibits. Liguria (19 Avenida Luis Thayer Ojeda; Santiago; Telephone (56-2) 231 13 93) was a two-story family style Italian restaurant with a large, diverse selection. Pastas and seafood selections rock the menu. Ask to be seated upstairs and try for a table overlooking the railing. From this perch, you’ll be able to take in all the artwork on the two-story high walls, people watch the diners below and listen to the band if they are performing in the piano corner. Piegari Ristorante (located in the Noi Vitacura hotel; Av. Nueva Costanera 3736; Santiago; Telephone (56-2) 941 80 00) is the newest location for this 16 year-old Italian dining experience. The hand-made pastas and the Argentinian beef are but two of their specialties. Seafood lovers, there are no less than 11 seafood appetizers. The Calamares a la Romana were fried just perfectly and made a superb side to a wonderfully large Caesar salad. Not a seafood lover? There were 13 other non-seafood appetizers to choose from – the Carpaccio di Manzo and Empanada Vitello being a couple favorites. 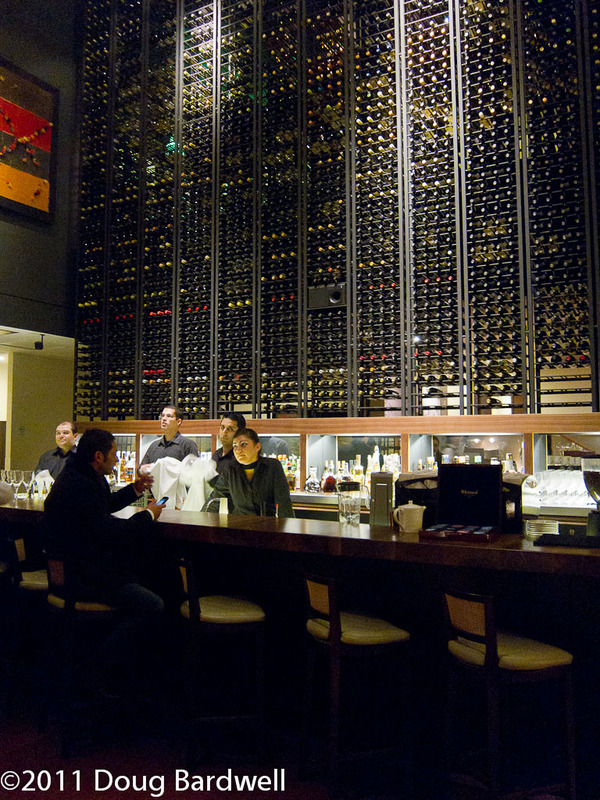 Akarana Restaurant and Bar (Calle Reyes Lavalle 3310, Las Conde; Santiago, (56-2) 231 96 67) was founded by a pair of New Zealander’s who wanted Santiago to have a place for authentic Pacific Rim dishes. They succeeded without question. Lamb and tuna were both instant favorites. For desert, the “Bomb” lives up to its name and is to die for...a hot chocolate pudding with hazelnuts and blueberries over a liquid center of white and dark chocolate. Oh yeah, it’s served with a side of vanilla ice cream. Save room for it. If budget is not your primary concern, you’ll not regret selecting one of these two fine hotels. 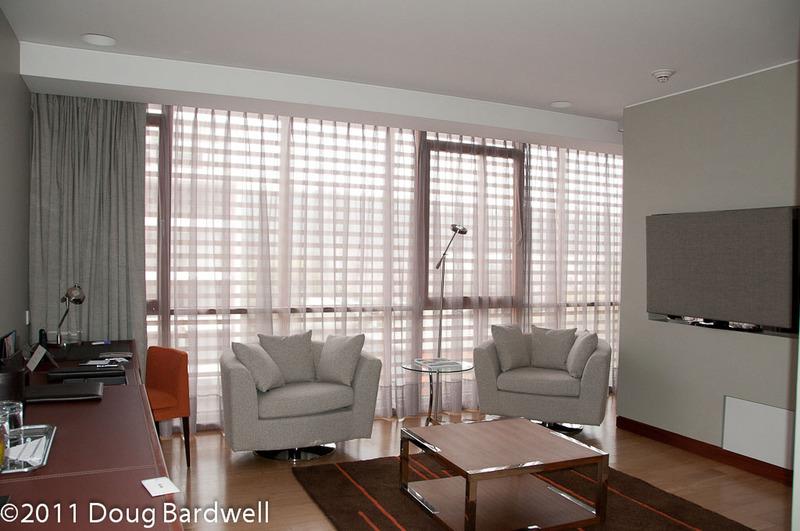 Noi Vitacura suites offer separate work and sleep areas. Noi Vitacura Hotel (Av. 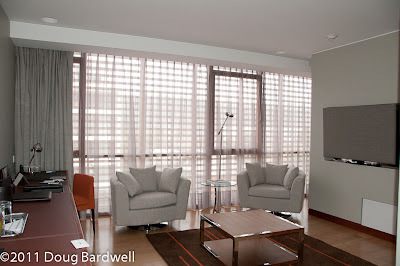 Nueva Costanera 3736; Santiago; Telephone (56-2) 941 8000) as of this writing is probably the newest luxury hotel in Santiago. Located in the Alonso de Cordoba neighborhood, you are across the street and around the corner from some of Santiago’s highest quality fashion, furniture and décor shops. The hotel rooftop has a beautiful pool, full-service bar and cozy fireplace area. The exterior of the hotel employs solar screening slats that reflect heat and give the building a decidedly 21 century appeal. With 87 rooms, there is assuredly one that will fulfill all your comfort needs. Large flat screen televisions, electric floor-to-ceiling curtains and plush Italian bathrobes are immediate touches that speak of luxury. The waterfall shower with step-less entry, the Noi branded toiletries and a full drawer of grooming needs provide even more obvious hints that you are being as pampered as you really deserve. An expansive breakfast buffet downstairs awaits you each morning, assuming you can pry yourself from the comfy bed. Custom made omelets are only a request away. With a business center, a full service spa and beauty center, a fitness room and a couple bars, chances are you might just want to spend your entire day here. That’s not a bad option. Take a look at their photo gallery to appreciate the rooms and the neighborhood. The Aubrey Boutique Hotel (Constitución 299 – 317; Bellavista; Santiago; Telephone: (56-2) 940 2800) is where you might want to head if you are looking for old-world charm for your evening destination. This multi-award-winning hotel is located in the bohemian Bellavista neighborhood – home to jazz, bars and eclectic architecture. A walk uphill will reward you with great city views from the top of Cerro San Cristobal Hill. All rooms come with an inclusive Brazilian breakfast, free WiFi, LCD cable TV’s, and feather beds with fine cotton sheets. Massage and manicure services, valet parking, laundry service, cell phone rentals, bicycles and day passes for Balthus Gym all lend to the allure of this fine hotel. Flying to Santiago, despite the distance from Cleveland, was a very easy pair of flights. I flew American Airlines from Cleveland to Dallas and from Dallas to Santiago. Connections were smooth and I even had enough of a layover to enjoy the American Airlines Admiral’s Club in Dallas. (Santiago has an Admiral’s Club as well, which I used on the return flight.) This was my first time using the Dallas club and I was mightily impressed. From the showers, to the children’s room to the quiet rooms – there was something there for everyone. American Airlines makes it easy to use their clubs with one day passes, a new 30 day pass as well as annual memberships.